In a large bowl, combine the masa, chaya, and salt by kneading with your hands. Pinch off a large, golf-ball sized piece of masa and roll it into a ball, then gently flatten with your palms. Place the flattened masa on a piece of plastic wrap and use your fingers to press it into a flat round tortilla about 1/8" thick (alternatively, use a tortilla press). Repeat until all of the remaining masa has been used up. 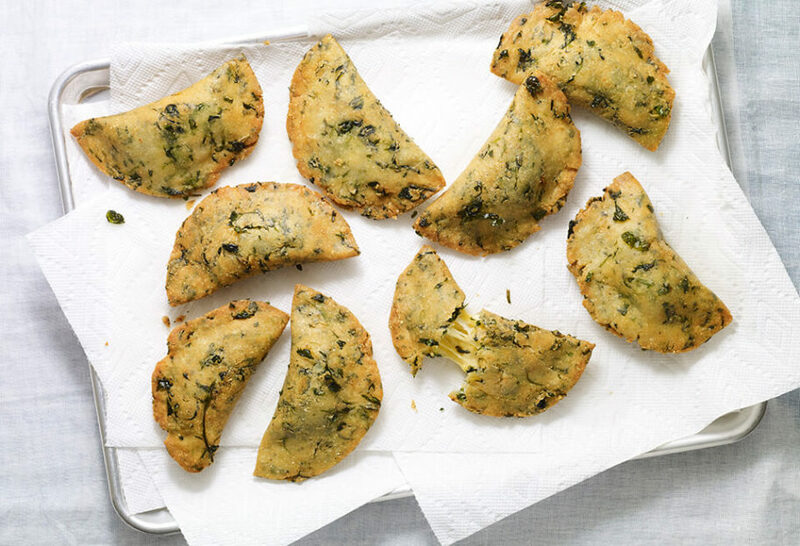 Place 1/2 cup of the grated cheese on one side of the masa round, then fold over to make a half-moon shape. Press around the edges with your fingers to close, using the plastic to help you out. Repeat with all the masa rounds. In a large casserole or heavy bottomed pan, heat ½” of oil to 325 degrees Fahrenheit. If you don't have a fry thermometer, test by dropping a small ball of masa in the oil; if the oil actively bubbles around it, it's ready. Working in batches, fry the empanadas in the oil until crisp, about 2 to 3 minutes per side. Place the fried empanadas on a paper towel lined plate to drain off the excess oil. You may serve them with a side of warm salsa roja or salsa of your choice. I can’t find the Mondongo a la Andaluza recipe anywhere. Could you possibly send me a link for that recipe?? Thank you! There was another botana that was made with ground beef. With David on this show. Can I get the receipe. That was a field piece…so I don’t have the recipe. Hi Pati, can you tell me how to prepare the corn masa for those empanadas? Hi Pati that all looks very deliciuos can you share the recipe for the modongo want to try!! Marianna, I will try to upload the recipe that Chef Pedro made to YouTube very soon​! Hola, Pati. I love your TV shows and recipes. I want to make these empanadas but can’t find chaya here in Mississippi where I live. Can I substitute fresh Swiss chard or kale for the chaya leaves as well as substituting with spinach or watercress? Thank you!